The U.S. has called for a credible investigation into allegations of irregularities during Sunday’s National Assembly election, which the ruling CPP has said it won with a much reduced number of seats. 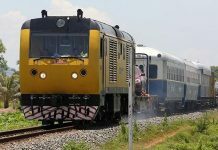 The opposition CNRP, which according to preliminary figures took 55 seats to the CPP’s 68, on Monday rejected the results. CNRP presi­dent Sam Rainsy called for an in­dependent committee—involving the National Election Com­mittee (NEC), both parties, the U.N. and civil society—to be established to investigate electoral fraud. At the U.S. State Department’s daily press briefing in Washington on Monday, which took place after the opposition’s announcement of its rejection, spokeswoman Jen Psaki congratulated the Cambodian people on a peaceful election. “We urge all parties and their supporters to continue to act in an orderly and peaceful manner in the post-election period,” Ms. Psaki said, before addressing the opposition’s claim that election fraud on a large scale undermined the validity of the result. “We are concerned by numerous reported irregularities in the electoral process. 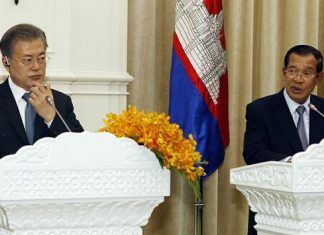 We have consistently called on the Royal Government of Cambodia to ad­dress…systemic flaws, such as problems in the voter registry and unequal access to the media. We call for a transparent and full investigation of all credible re­ports of irregularities,” she said. Ms. Psaki said the State Department’s comments did not mean the U.S. was backing the opposition’s call for an investigation specifically. 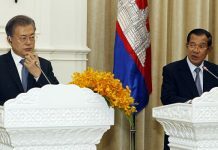 “In light of the reported irregularities, we call for a full and transparent investigation that will be [viewed] as credible by the Cambodian people,” she said. Yesterday morning, CNRP president Sam Rainsy, his wife, Tioulong Saumura, and party vice president Kem Sokha were seen leaving the U.S. Embassy in Phnom Penh. Embassy spokesman Sean McIntosh confirmed that the opposition leaders met with U.S. Ambassador William Todd, but said he could not disclose what was discussed. Senior CNRP members also declined to comment on the nature of the meeting. Mr. Rainsy also formally wrote to NEC Chairman Im Suosdey yesterday to request an investigation. “People who had their names in the voter list and have voted before had disappeared or were incorrect,” the letter says, specifically naming the U.S. among those who should be involved in an independent investigation. “Therefore, in order to give justice to the voters and political parties…the NEC must create a joint committee immediately to investigate these irregularities,” Mr. Rainsy said. NEC Secretary-General Tep Nytha said that the CNRP’s demand would be rejected. “The NEC does not have the right to establish a committee. It is out of the NEC’s authority,” he said, adding that more election results would be released by August 10 and that the new National Assembly could begin after final results are published on August 14. Foreign Affairs Ministry Sec­retary of State Ouch Borith said investigating complaints of irregularities was the job of the NEC—a body seen by observers as lacking independence from the ruling party. “This is the duty of the NEC,” Mr. Borith said after a meeting between Foreign Minister Hor Namhong and representatives of election monitors from Franco­phone countries. “My opinion is the opposition party’s complaint is nothing different from the 2008 election,” he said. “In front of hundreds [of] international and thousands of national election monitors, what reasons will the opposition party make to cause trouble in establishing the government?” he said. In another statement yesterday, a spokesman for Catherine Ashton, the high representative of the European Union, said that some steps had been taken in response to recommendations made by an E.U. observation mission in 2008. “However, the High Representative regrets that the authorities did not take all necessary actions to address some of the key shortcomings such as improving the reliability of the voter list, ensuring equitable access to media and preventing the use of State resources including campaigning by civil servants and the military,” says the statement from the E.U., which did not send election ob­servers this year.